I have what seems like an infinite to-do list for this summer. So many things I need to do and want to do, but one of those projects is a must: update my resume. 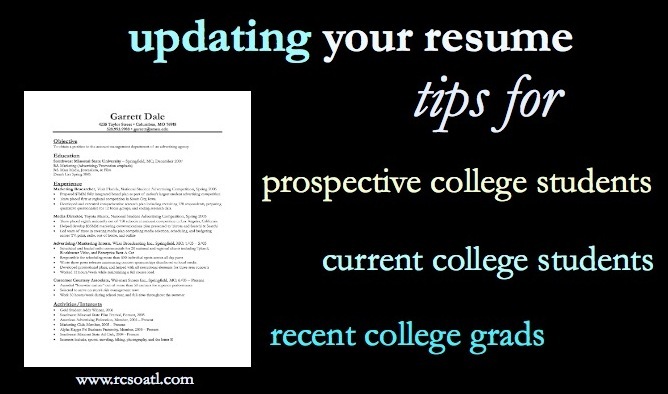 Once you get into college and start applying for anything really, you'll need a resume on file to submit. Summer is the perfect time to update your resume, and I've broken down the tips for updating into three categories of students (high school students entering college, current college students, and recent grads). Same rules go for your LinkedIn profile! RCSOATL also offers resume review services! What's your favorite part about your resume? I'm working on updating right now, love it! You make great points and this is a great post! I remember updating my own resume and wanting to put my head through my laptop, bah! ugh i hate resumes. this will help though! Humm. I should probably do this. But my resume is super boring, there isn't really a favorite part.